Happy New Year dearest readers: I hope Santa filled your stockings and you had a debauched New Year, or as us Scots say, Hogmannay. I love Christmas. I love the festive joie de vivre, the sparkly lights, the carols and I love, love, love Christmas pudding. However, almost above everything else, I love Christmas because it precedes the January Sales: the perfect cure for a mulled wine hangover. If you haven’t shopped yourself out before the 25th December, now is the time to be trawling the rails or cruising the Internet looking for a bargain. Before you set out though, I would recommend a battle plan. A bargain aint a bargain if you never wear it! As always, there’s going to be lots of pieces from the 2010 collections that carry over into 2011, so if you spot some of these bad boys on the sale rails it’s a good idea to snap them up (and then feel smug when they come back in at full price!). Lace: I’ve said it before and I’ll say it again. Love lace. It’s still a big hitter this year and it’s a great fabric that will work right through into the warmer months. Lace dresses worn with thick tights just now can be ‘Summerized’ come Spring, when (hopefully) it will be warm enough for us to get our pins out! 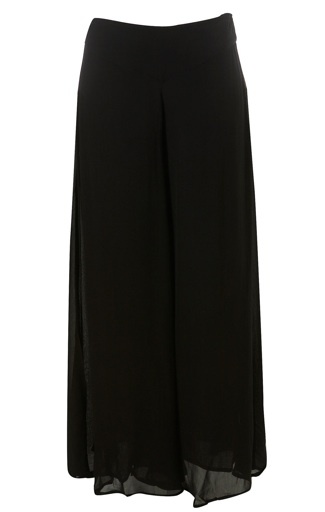 these maxi wide legged trousers from Topshop for £15 and I’m going to do just that when the weather heats up. Topshop already have some in their new collection, which are almost identical but completely sheer. Biker: Leather has been kicking it back for the last few seasons but has remained somewhat in the shadow of the military trend. But Spring 2011 see’s it rev it’s engine a little more, so keep hold of the boots, the jackets and, for the bold, the leather shorts. I spotted a real leather jacket in the sale for £60. Bargainous! 60’s Ladylike: The clothes that make Madmen, or men go mad, if you prefer. Curves are still big, with strong silhouettes being the key to this look. I haven’t seen much in my ‘saling’ (clearly, you’ve picked ‘em all up already!). By Spring, the fabrics will be lighter and the colours fresher, however, if you do spot something 50’s/60’s with a lovely red reduced tag on it, be sure to pick it up! Bell-Bottoms: I don’t know about you, but I was a little unsure about skinny jeans to begin with (“but they show eeeeeverything!” I wailed). Now, I can’t live without them. However, a new year, a new decade for that matter, and the trends they are a changing. 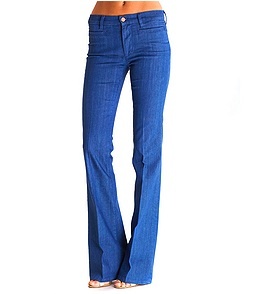 70’s glamour is going to be a rising trend over 2011 so it’s perhaps inevitable that flares would make a return too. Wear them high, and wear them wide! Kitten Heels: I’ve heard a rumour that the more delicate shoe is making a comeback this year (after clogs, I’m sure we’ll all breathe a sigh of relief!). Personally, I’m not totally sure about this trend; a high heel can do wonders for the posture and the self-esteem. My feet, however, are delighted. I know I should love lingerie (what with being a girl and everything) but knickers are what get men hot under the collar, for me the undergarment to get excited about is the sock. I’m delighted, therefore, that this winters the world has gone hosiery crazy; with knee high and thigh high socks being the latest leg attire of choice for the fashion forward. I'm so excited OTN socks are back in, I'm practically doing cartwheels..
Last year, the king of shoes ‘the thigh boot’ made a brief appearance, but the trend didn’t really catch on. I think it was partly practical: it looked hot (and felt it too) but a leg clad entirely in leather made walking a little difficult. Fashion laughing in the face of pedantics or podiatry isn’t anything new. Thankfully, though, this winter it’s all about a softer take on the trend; keeping the lanky silhouette but with the more flattering approach of long socks, heels or boots. So, grab you yourself a pair, pull ‘em high and wiggle your tootsies in delight. Pick the length wisely: in the same way you would with skirts. Over the knee socks are a focal point and draw attention to your (gorgeous) pins! Well heeled? Knee socks look girly with heels, strong with knee-high boots and cute with flats. Beware the bulge… fold down the top of the socks if they are at all tight around your thigh or knees, high socks are slimming but a thigh squeeze can be as unsightly as a muffin top. Shorter hemlines are best. If you can, be daring, as they expose more leg and imply greater height. Avoid big knitted socks: not only are they so 2007 (seriously) but I never really liked them anyway; big chunky knits make legs look like sausages. Not so tasty. Say no to the Schoolgirl look, unless you are. Over the knee and short kilts might work for Gossip Girl but you’ll barely be able to get down the street without wolf whistles, salacious remarks and people presuming you’re in fancy dress.